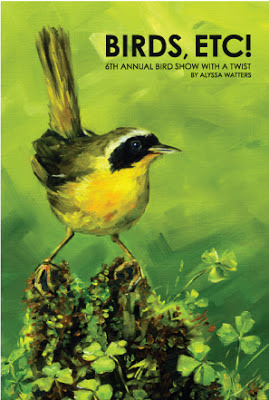 Back again after last year's "BIRDS 2012," Alyssa Watters, also known as "bird girl," has put together her newest show with a little twist. IT'S NOT JUST BIRDS! Stop by March 7th to see what else has found a home in this years show. a show curated by Montserrat College of Art's Bear Gallery, a student run organization that "bridges the gap between art student and professional artist"
"Otherworldly" is a two dimensional exploration of the personal creativity of Montserrat students. Every artist has a drive that keeps them creating, and oftentimes that drive is of a personal nature. This show will give Montserrat students the chance to show why they love art, what they live for, and to inspire others to create the art that they truly want to be making. Work includes: original fantasy, science fiction, psychological spaces, extraordinary creatures, and exciting places. First Thursday Opening Receptions are held the first Thursday of every month form 5:00pm - 7:00pm.